Located in the heart of Barcelona, the H10 Montcada is a Boutique Hotel housed in a neoclassical building typical of the Via Laietana. The contemporary, warm interior design of its rooms, communal areas and Chill-Out terrace with spectacular views across the city give it a special charm and make it the perfect place to stay in Barcelona. Located just a stone-s throw away from the sea with excellent views over the fine sandy beaches and azure waters of Costa Calma, the H10 Sentido Playa Esmeralda has recently been refurbished by the renowned interior designer LÃ¡zaro Rosa-ViolÃ¡n. Its lobby, presided over by an original birdcage-shaped bar, its walls decorated with brightly coloured birds and its redecorated rooms give the whole hotel a distinguished, modern feel. In addition, it offers guests a newÂ Despacio Spa CentreÂ and the delicious cuisine of the JandÃa Buffet Restaurant with show cooking. TLocated on a small peninsular on the Costa d'en Blanes in the south of Mallorca, surrounded by sea and with direct access to two coves with crystalline waters, the H10 Punta Negra is the ideal place to relax in one of the island's most beautiful areas. Its recently refurbished rooms, its carefully selected cuisine and its gardens surrounded by pine trees make the H10 Punta Negra one of the island's most emblematic establishments. 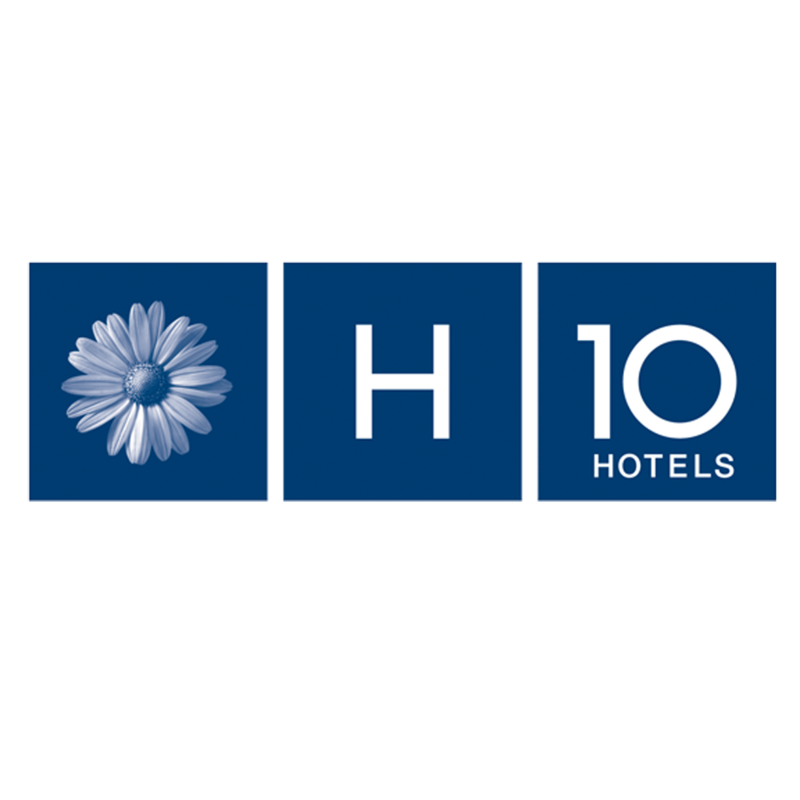 Opened in 2011, the H10 Berlin Ku-damm is located just a stone-s throw from KurfÃ¼rstendamm avenue, western Berlin-s main shopping street, and very close to the Kaiser Wilhelm Memorial Church and the Zoo. Its construction conserved one of the city-s historic buildings, to which another new building has been added. The hotel-s services include the Despacio Beauty Centre, Salt & Pepper Restaurant, Steps Bar and five meeting rooms. The hotel has recently received the prestigious HolidayCheck Award 2013â€ in the Country-s No. 1 category. The H10 Taburiente Playa stands on the seafront, just 300 metres from the renowned Los Cancajos beach. The hotel's terraces with sea views, comfortable rooms, varied range of cuisine and large swimming pools make it the ideal place for your stay on the island. With its seafront location in the village of Los Cristianos, the H10 Big Sur is a Boutique Hotel that specialises in adults- holidays. This exclusive hotel has been fully refurbished with an elegant, Mediterranean interior design with a vintage touch. Discover its range of services, including the Blue Bay Restaurant, Cactus Bar, new outdoor pool area, Chill-Out terrace with sea views and Despacio Beauty Centre. Located in a charming pedestrian street in the heart of the Gothic Quarter, the H10 RacÃ³ del Pi is housed in an 18th century building listed as part of the city's historical and artistic heritage. Tradition and modernity come together in peaceful, welcoming space designed especially for a relaxing stay in Barcelona. Located in northern Tenerife along the coastal town of Puerto de la Cruz, the H10 Tenerife Playa stands in a prime location on the pedestrian promenade in front of the famous Lago MartiÃ¡nez, just 50 metres from the sea. The hotel's complete facilities include swimming pools, a varied array of dining options and meeting rooms for any type of event. In addition, the hotel now offers Privilege, Exclusive Rooms and Services.